My start-up company uses Google+.When I tell this to people, I usually get asked why. Why would anyone bother to use Google+ when nobody is on it? The short answer is that because Google+ is a Google product, it helps with search engine optimization (SEO) for the company website. But there’s more to it than just SEO.I post content to our website blog for he usual reasons – to share information with customers, inform about the industry and market, spark technical discussions, and promote ourselves. The blog that we post is also re-purposed for Twitter, LinkedIn, and Google+. Most people recognize the importance of posting to LinkedIn and Twitter, and yet, oddly, ask me about Google+. Today, Google+ is still quite small as a community. Most of my friends and family are on Facebook, not Google+. But, it’s continually growing, and it is a Google product, which means it has enormous corporate support to help it grow. Will it ever become as big as Facebook? I don’t know. Ignoring Google+ just because it’s not big yet seemed a bad idea. Creating a presence now, while more domains and potential company names are still available, makes more sense.. Google calls Google+ the “social spine that underpins and strengthens all of Google…” Google’s goal is not to have ‘just’ a social network, but to create an integrated social system. Sounds great. And yet … the reality is that today, the content on Google+ has had only a minimal impact on the number of visitors that come to our website. The posts we created in Google+ are theoretically helping build SEO for our company, but no customer interactions or leads have resulted, and visitors who “+1’ed” the site generally did not do the same for any of the content so while Google sees a bright future for Google+, it’s not having much effect now. Which unfortunately brings us back full circle to … why use it? We are using Google+ because while its impact is low today, it will likely become bigger in the future. We currently don’t create any new content for Google+ nor do we create Google+ specific content. But I’m there, and posting, and participating to make sure when it becomes big, we’re already part of it. 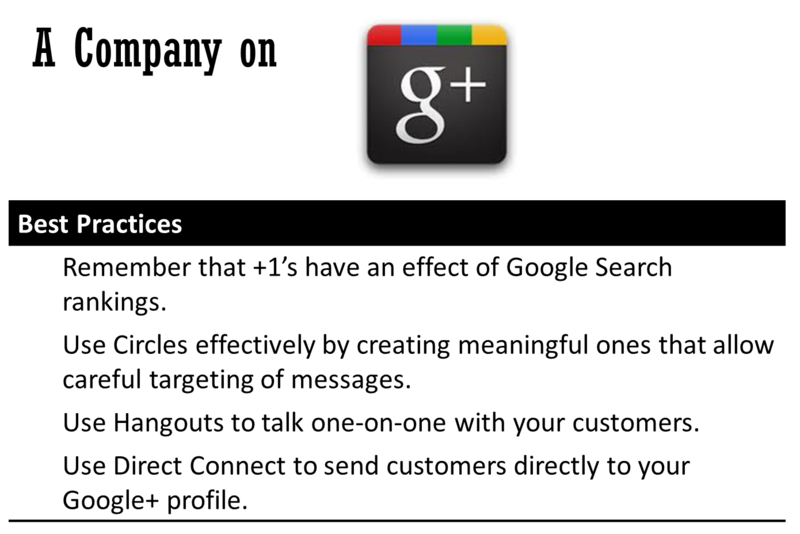 Google has already forced integration of Google+ with some services ,which is driving this growth. And while some folks are not happy about this, in most likelihood, it won’t go away anytime soon. Google+ is an additional resource for engaging businesses and people through posts and hangouts –we once used Google+ hangout for a virtual tour of the company office that proved particularly successful because it enabled a casual “meeting” without people traveling to our physical location. We have also added the “+1” button to the company website as a way to build traffic. Google+ has some really cool functionality, like the hangouts, but it could certainly be improved. While Google+ is still relatively small, it is useful both for SEO and hangouts, and as it grows, will become more and more relevant. When our company is large enough to have a bigger marketing team, I will create content specifically for Google+. A side note: Keep in mind my discussion is looking at Google+ from a company perspective. In my research I have seen many posts, articles, and comments about the issues people have with Google forcing Google products users to create a Google+ account and Google privacy issues. I certainly acknowledge that these are serious discussions and we should talk about them, but personal use of Google+ wasn’t my focus here. A special thanks to Professor Valarie Zeithaml who shared so much important information on this topic.